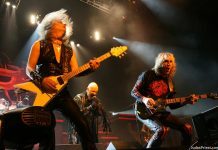 Learn how to play Hellion & Electric Eye the two stage favorites by the masters of heavy metal, Judas Priest. “Electric Eye” by British heavy metal band Judas Priest, from their 1982 album Screaming for Vengeance, and released as a single later that year. It has become a staple at concerts, usually played as the first song. Musically, the song is in the key of E minor, and its guitar solo is played by Glenn Tipton. “Electric Eye” is featured in Grand Theft Auto: Vice City Stories for PSP and PlayStation 2. It is also a playable track in Guitar Hero Encore: Rocks the 80s as a master track, including “The Hellion”, and it also appears on Guitar Hero Smash Hits. Additionally, it is available for download on Rock Band, as of 22 April 2009, as part of the entire Screaming for Vengeance album download, or as a single song. It was also featured in the second trailer for the video game Brütal Legend. This song is referenced in the movie Tenacious D in The Pick of Destiny, in the song “Break in-City (Storm the Gate!)”. “Electric Eye” is an allusion to the book Nineteen Eighty-Four by George Orwell, in the use of the name of the pseudo-omniscient satellite that watches over the community at all times. In this dystopia, the form of government, Ingsoc (Newspeak for English Socialism), is utterly totalitarian, and if citizens are caught rebelling in any manner, they “disappear”. The song has been called “prescient” for its depiction of a modern surveillance state. 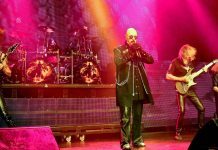 During live concerts, the song is usually played right after the album’s intro “The Hellion”. 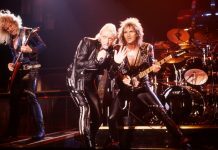 An exception is during the tour for the album Demolition, in which the band went straight into “Electric Eye” with no intro, which can be heard on their live album Live in London. “The Hellion” was also used for a commercial for the 2011 Honda Odyssey.